Enter to Win a Free 7 Night Vacation Home Rental! 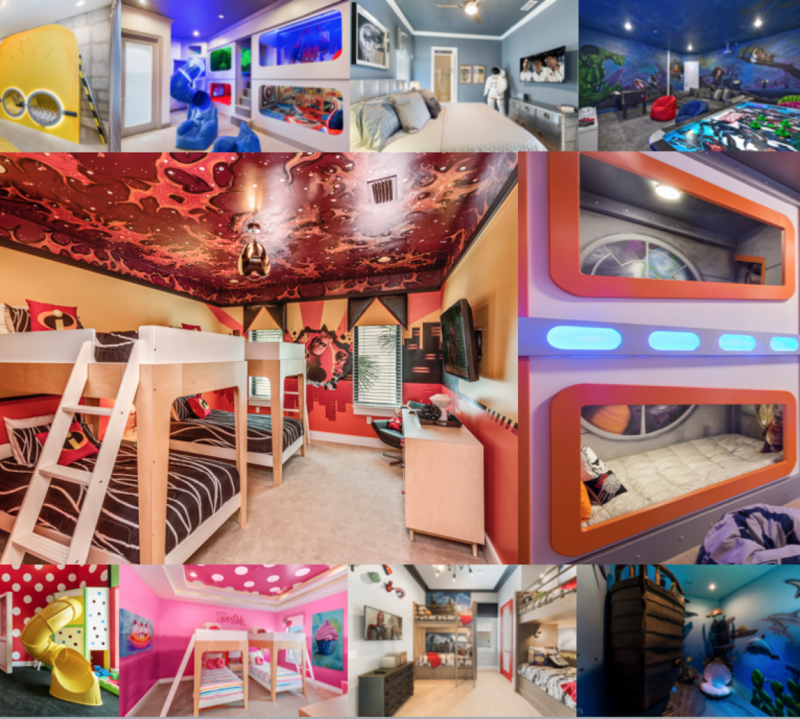 Have you always dreamed of staying in a magical home, where you can choose from sleeping in a castle, to watching your favorite superhero movie while surrounded by your favorite characters? All of your vacation dreams can come true with a stay at The Fun House at Reunion! This luxury 5 bedroom villa located in Reunion Resort has everything you need for a magical vacation — and you now have the chance to win a free week! That’s right — enter to win a free week at The Fun House at Reunion (RVH_520) by submitting your favorite Orlando vacation memory photo HERE. By entering our #MagicalStays contest, you’re entering for a chance to win a free 7 night stay in this incredible new vacation home rental. Every inch of the 3,374 square foot house features luxurious furnishings, the latest technology and magical details to truly make it a home away from home. Each bedroom is customized for both the kids and the adults. Little princesses will love the opportunity to sleep in their own castle, and Jedi knights will love to sleep in their own galactic getaway complete with a fun slide! Adults enjoy King sized beds, and beautiful decor. One room even features a life-size astronaut and fiber optic star ceiling! All bedrooms have their own SMART TV and ensuite bathroom. A great feature is the west-facing private pool and spillover spa. Soak up the famous Florida sunshine while lounging on the patio furniture, or cook a meal outdoors in the summer kitchen and dine outdoors! Play all day in the lounge games room with fun arcade games and a Star Wars Battle Pod Arcade. Get your game on playing foosball or going head to head on the video game systems. At the end of the day, curl up and watch your favorite superhero movie on this 120 inch movie screen in the private home theater. This amazing property is only minutes away from Walt Disney World Resort, and close to other amazing Orlando Area attractions including Universal Studios and SeaWorld. Share a photo of your favorite Orlando vacation memory with us. Be sure to keep sharing with your friends and family to get the most votes and win a free stay at The Fun House at Reunion! Windsor Hills Water Park Now Open! A brand new splash park and water slides just opened at Windsor Hills! Windsor Hills Resort, located only two miles from Walt Disney World, opened their brand new multi-million dollar water park in August 2018. This new Windsor Hills Water Park features a splash pad area and two dueling water slides! The water park area is open for all Windsor Hills Resort guests staying in a vacation rental, as well as Windsor Hills owners. The Kids Zone splash park features splashing fun for kids of all ages. The large climbing structure features a water wheel designed to soak the whole area, as well as two smaller water slides for the little ones. The whole splash zone is surrounded by water cannons and surprise spray flowers to ensure that you will stay cool in the Florida sunshine. Head over to the two dueling water slides for 23 feet of spiral sliding fun! Race your family and friends to the finish on these state-of-the-art slides. Each slide is a different exciting riding experience. In addition to the new splash park and water slides, Windsor Hills Resort opened up a new oval hot tub for total relaxation and new expanded deck space. All of these amenities, including the Double Olympic Size Pool, Tennis Courts, Castle Playground and Community Clubhouse (including 40 person movie theater! ), are included in your reservation and free to use when you stay in a Windsor Hills rental! Check out our amazing selection of Windsor Hills Rentals, from value 2 bedroom condos to luxury 5 bedroom homes, all of them located only minutes away from Walt Disney World! Vacation Fun, pictured above, is a new 3 bedroom condo with luxury furnishings and a custom kids bedroom, starting at only $89 a night!